What will I do with Halloween cards? WELL I JUST DON'T KNOW! But they are kinda fun to make. I used the LO from the August issue of Sheetload of Cards website for this one. I was able to make 6 at once. I used PDDU for the ghost, bat and spider. The sentiment is a Studio G from series 12. The paper is some scraps that my LSS owner gave me today so I have no idea what line or company it is from. 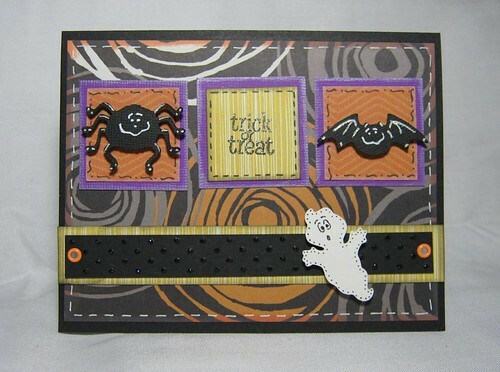 I did use the swiss dots cuttlebug folder on the black strip. And of course I had to add some Stickles!! *okie knows everyone is surprised that she used Stickles..HA! * I like this card design and it seems like it will work well with a lot of the Studio G stamps!! I want to try this LO with some fall/Thanksgiving cards also! Adorable!!! Okie, You make the best cards! I love them all!! Saving this one to my favorites! !